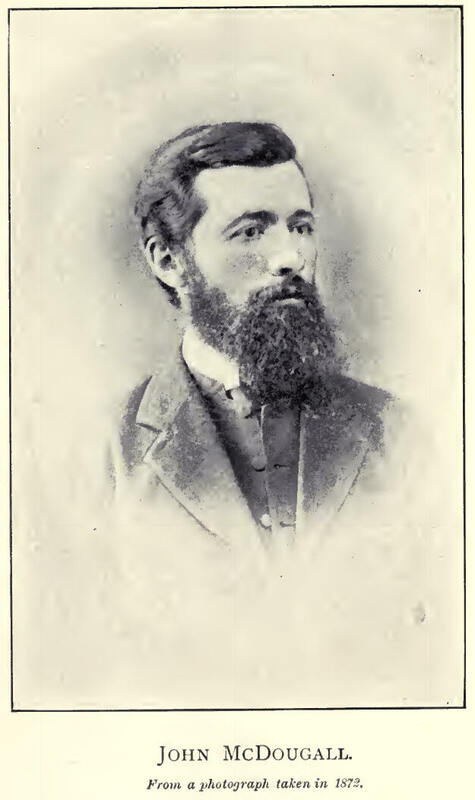 John McDougall was born in 1842 in Sydenham, Upper Canada to George and Elizabeth McDougall. George McDougall was a Methodist missionary and, as a result, John grew up attending mission schools and learning to speak Ojibwa and Cree. In 1862, George McDougall (by this time the Superintendent for the Wesleyan Methodist Church in Canada) decided to move his mission West, and the family relocated to the Victoria Mission. There, John worked as an interpreter and teacher and, in 1864, married Abigail, the eldest daughter of the Reverend Henry Bird Steinhauer and Jessie Mamanuwartum. That same year he became a candidate for missionary service. John and Abigail were appointed to reopen the Pigeon Lake Mission, from which John visited Aboriginal camps and Hudson's Bay Company posts at Rocky Mountain House and Fort Edmonton. These were tumultuous years for the missionary: violence was escalating between the Assinboine, Cree and Blackfoot tribes; in 1870-71 a smallpox epidemic swept the plains; and in 1871, Abigail died. After his wife's death, John travelled back to Upper Canada where he was ordained and married his second wife, Elizabeth Boyd. In 1873, they moved south and established a new mission at Morley, on the banks of the Bow River, to serve the Stoney people. Throughout his life, John McDougall was involved in public and Aboriginal affairs. During the 1870s he was present for the negotiation of Treaty 6 and Treaty 7. During the North-West Rebellion he accompanied the Alberta Field Force, negotiating with tribes to stay on the side of the government. In 1897, he was named chairman of the Indian District, comprising parts of all four present western provinces. After his retirement in 1906, he served as a commissioner for the Dominion Government and Department of Indian Affairs and later (unsuccessfully) ran as a Liberal representative for Calgary Centre. In 1917, John McDougall died in Calgary. John received many honours for his work as a missionary. He was elected in 1893 and 1906 to serve as President of Conference to the Methodist Church and, in 1903, he received an honourary Doctorate of Divinity from Victoria College. The United Church restored his mission church at Morley and in 1977 declared it a historic site, recognizing its importance in the development of Methodism in Western Canada. 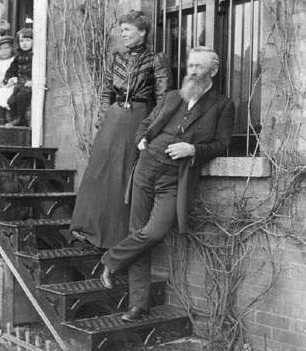 Both John and his wife Elizabeth Boyd were, during their later years, counted among the most prominent citizens in Calgary. John McDougall's legacy, like that of other missionaries, has been debated. The Methodist Missionary Society and traders criticized him for fur trading with the Aboriginal community, an activity he justified on the grounds that it helped to fund his mission work. His Morley residential school has, like similar institutions, been the source of controversy and accusation. The objectivity of his advice to the Aboriginal people during the treaty period has also come under fire. However, as evident from his writings, McDougall believed he was acting in the best interests of the Aboriginal community: "the Indian's past was dead to progress; dead to the destiny of our race, and there had to come a wonderful change." or "White Buffalo", The Hero of a Hundred Battles. Tale of Life in Canada's Great West During the Early Years of the Last Century.